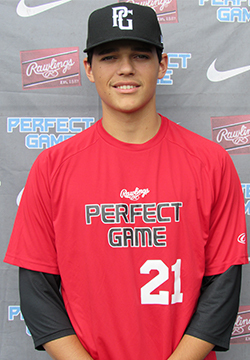 Nolan O'Brien is a 2019 RHP/ with a 6-4 195 lb. frame from Pound Ridge, NY who attends St. Luke's. Long, lean frame with wiry strength throughout. Frame projects to support additional size with strength. Primary right handed pitcher with a smooth paced delivery. Deep arm circle at at take back released from a three-quarters slot. Good arm speed while with a fastball offering that showed heavy running life with downhill plane in the low to mid 80's, topped at 84 miles per hour. Consistently pounded the bottom of the strike zone with fastball and induced weak ground ball contact. Maintained arm speed with a slider offering that had looser spin with short, deceptive tilt to glove side in the low 70's. Flashed a changeup of out hands that showed occasional fade in the mid 60's. Worked quickly while on the mound and aggressively attacked the zone with all pitches. Good student. Named to the 2017 Northeast Underclass Showcase, Top Prospect List.